Reduces side-to-side and fro-to-aft movement of your coach. 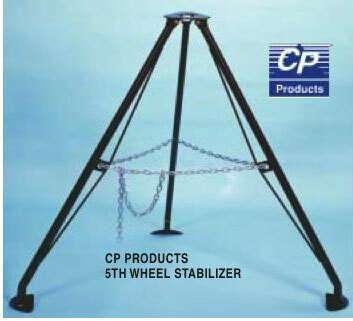 Designed as stabilizers for 5th wheel trailers with a king pin height of 38.5" to 50". Easy to use with a simpl, but effective, chain system that links and locks tripod legs to the proper height. These stabilizers work in conjuction with your coach's supporting jacks and are not intended to support the full weight of your coach. Their maximum vertical load rating is 1250 lbs. made of rust resistant steel 1/box.